They tell their partners about what they want to achieve in their lives, but instead of getting a “Go for it, I will support you!” they get something quite different. The kind of responses that root you to the spot, and makes momentum building almost impossible. So what do you need to do when you want to change direction, but the relationship that you are in is not interested? Well in today’s episode of Join Up Dots we give you five steps to take in your own time, to assess what needs to be done in your life. Big questions are required to be answered in your life and they start here. Thanks so much for listening to this episode of Join Up Dots and we look forward to answering all your questions. 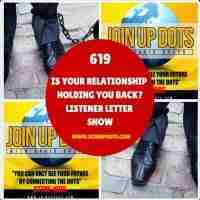 Just drop us a line to joinupdots.com@gmail.com and we will get your message onto the show.